Hi! I teach different levels of English, from 3 year old Ss to adult learners. br Thank you all for sharing your work!! 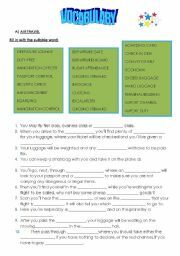 This is a worksheet made for tourism students. It has 3 different types of exercises concerning travelling vocabulary. Hope it´s useful!! 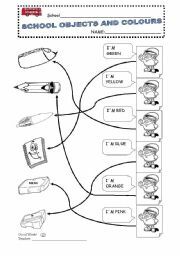 This is a simple worksheet for younger students to practise colours and classroom objects. Hope it´s useful!! 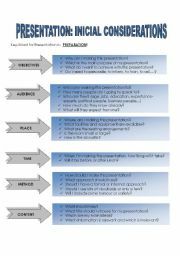 This worksheet can be adapted to a powerpoint presentation. Rules about making a successful presentation. A few rules about how to make a bad presentation and how to be a bad presenter. Some simple multiple choice exercises, at the end. Hope it´s useful! Filling in the gaps with the correct connector. A worksheet for Ss to stick on their notebooks. 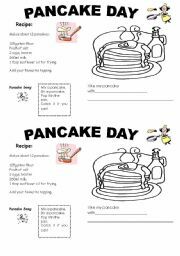 It has a pancake recipe, funny images, a song about the day, a pancake to colour and a sentence to complete. 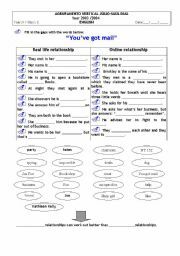 Human body, shapes, personal pronouns - he, she - jobs, numbers, reading comprehension. 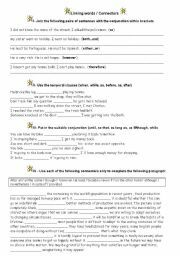 After watching the movie "You´ve got mail", Ss are able to do this worksheet. 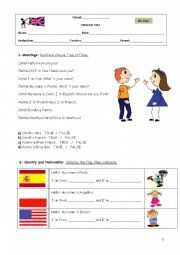 Worksheet about vocabulary related to work. Hope it´s useful!! This is the first test of the 6th grade. It has listening part, Reading comprehension, vocabulary: jobs, grammar and a composition: writing an email. Hi! This is a perfect test for 4th graders.